When your head hits the pillow at night, is your mind off to the races, making it feel impossible to fall asleep? Do you wake up in the middle of the night with your mind racing, unable to slow it down and go back to sleep? Almost all of us are dealing with significant levels of stress and anxiety about family, relationships, health, work, and/or finances. Ongoing stress and anxiety lead to an overactive nervous system. I spent over a decade completely at the mercy of my mind day and night. It was exhausting, painful, and an emotional rollercoaster. Subsequently, I learned about mindfulness and how to apply it. This changed my life. It is why I am training with two of the leaders in the field, Jack Kornfield, and Tara Brach, to incorporate formal mindfulness teaching in my private practice. There are three myths that I believe keep people from exploring and practicing mindfulness, the practice of taming the mind. In this post, I will debunk these three myths and give you the key to turning down your anxiety and stress that keep you up at night. Mindfulness and meditation are related, but they aren’t the same. You can be mindful without meditating, but you cannot meditate without being mindful. You can eat mindfully by slowing down and paying attention to how the food tastes, smells and feels. This is in contrast to scarfing down your food so quickly that you barely taste it. You can listen mindfully by paying attention and being present with the person doing the talking. You can do anything mindfully if you are practicing present-mindedness. 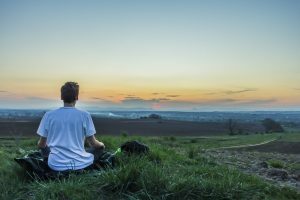 I’ll give you some resources at the end of the post that you can check out if you want to explore mindfulness and meditation further. This is false. It would be like asking a dog not to bark. The nature of the mind, if left to its own devices, is to produce thoughts and react to stimuli. Jack Kornfield likens the mind to a puppy. If you walk down the street with a puppy and just let it do its thing, you’ll never get where you want to go because the puppy will be pouncing, chasing, licking, and running all over the place. That is the puppy’s nature. When you train a puppy, you don’t expect it not to act like a puppy. You don’t abuse it when it does. You lovingly, consistently and firmly bring the puppy back whenever it gets distracted. Since puppies are constantly distracted, your job is to simply do it over and over again. Our minds are constantly reacting to stimuli just as puppies do. Mindfulness meditation is the practice of cultivating awareness of the nature of your mind. This is similar to the way you train a puppy. Again, it’s not about expecting the puppy not to act like a puppy. It’s all about consistently, lovingly, and firmly bringing the puppy back when it gets distracted. We are encouraged to exercise on a regular basis because of all of the health benefits. But what about exercising the most complex organ in our body, the brain? In order for exercise to be beneficial, we have to do it on a regular basis. The same is true for mindfulness. For new practitioners, we are starting with a mind that has tons of overgrowth. Practicing mindfulness will initially feel strange. All sorts of thoughts and feelings will be popping up. Maybe you’ll experience resistance in the form of a little voice telling you that it’s a waste of time. It’s all grist for the mill. A former meditation teacher of mine encouraged us when we were overloaded with thoughts during our practice that it wasn’t a waste of time. It was the mind’s way of emptying the trash. We often have to do this for months before it starts to quiet down. This brings us to the third myth about mindfulness and meditation about those of us with overactive minds. I used to take pride in the fact that I had an overactive mind. It made me feel smarter, tortured in a Woody Allen sort of way. It meant I was unable to fall asleep at night. I never knew what my state of mind was going to be from one day to the next. It was a rollercoaster and my mind was calling the shots. I have heard so many people tell me that they could never practice mindfulness or meditate because their minds are too active, or they are too distracted. But these are the people that can most benefit from practicing mindfulness. Remember, the goal is not to have a blank mind. Rather, the goal is to practice observing your thoughts and letting them come and go. Try the following short exercise using your breath as an anchor. Sit with your back straight and your feet flat on the floor. Start with your eyes open, maintaining a soft focus in front of you. Take 10 slow deep breaths and then allow your eyes to close. Breathe normally. Feel your body in the chair. Slowly scan your body from head to toe for any areas of tension or discomfort. If you have any pain or discomfort, just imagine that part of your body relaxing and healing. Breathe normally. Count to yourself one on the in-breath and two on the out-breath up to ten and then stop counting. Probably, within seconds, your mind will wander. You’ll begin to think about something. You’ll get lost in your thought. When you realize that you have been thinking, just say to yourself “thinking”, allow the thought to float away and return to counting your breaths. You’ll find that many times you won’t even make it to ten before your mind wanders off. Your only job is to consistently and lovingly bring your mind back to the breath like your bringing the puppy back to heal. Imagine not having to dread going to sleep. Imagine feeling like you are in control of your mind as opposed to your mind being in control of you. We all have such powerful tools at our disposal to help us to tame our minds, regulate our nervous systems, turn the dial down on our stress and anxiety. The amazing thing is that it is absolutely free. You don’t need fancy gadgets to do it, just a chair and a quiet space. Mindfulness and meditation have revolutionized my life and I am sure they can help you as well. It makes so much sense when you step back and think about why we shouldn’t be making the effort to train our minds the same way we make the effort to train our bodies. The beauty of it is that it doesn’t take a lot of time. Starting with just five minutes twice a day is all you need. That’s ten minutes a day. Then it’s about creating a habit, working it into your daily routine. If you do this, you won’t want to skip it. You’ll feel like something is off when you don’t do it like if you don’t brush your teeth. Meditation for Beginners with CD by Jack Kornfield, Ph.D.
Mindfulness Meditation: Nine guided practices to awaken presence and open your heart by Tara Brach, Ph.D.